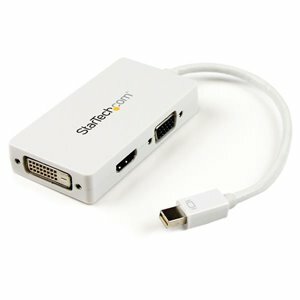 Connect a Mini DisplayPort-equipped PC or Mac to an HDMI, VGA, or DVI Display. The MDP2VGDVHDW Mini DisplayPort to VGA, DVI or HDMI converter offers a three-in-one solution for connecting an Mini DP video source (such as any of your MacBook or Microsoft Surface Pro devices with mDP) to a VGA, DVI, or HDMI Display. Ensuring compatibility with almost any display, television or projector, this compact and lightweight adapter offers the ideal plug-and-play solution for travel, or BYOD (Bring Your Own Device) applications around the office.You can walk into any boardroom and be ready to connect, even if you don't know what connection ports are available. The MDP2VGDVHDW maximizes the audio/video connectivity of your MacBook by offering three different output ports, in a single compact adapter.The three-in-one converter is compatible with Intel Thunderbolt, when connected directly to a supporting DisplayPort over Thunderbolt I/O port. Plus, because the converter cable supports video resolutions up to 1920x1200/1080p you can convert a Mini DisplayPort video source to VGA, HDMI, or DVI without sacrificing video quality.The Mini DisplayPort converter requires no power adapter and maximizes portability by easily travelling in your laptop bag with a small footprint and lightweight design. The MDP2VGDVHDW Mini DisplayPort to VGA, DVI or HDMI converter offers a three-in-one solution for connecting an mDP source such as a Thunderbolt™-enabled MacBook Pro® / MacBook Air® to a VGA, DVI, or HDMI Display. Ensuring compatibility with almost any display, television or projector, this compact and lightweight adapter offers the ideal plug-and-play solution for travel, or BYOD (Bring Your Own Device) applications around the office. The MDP2VGDVHDW features a sleek white design that looks great next to your MacBook® Pro or MacBook Air®, and is backed by a 2-year StarTech.com warranty and free lifetime technical support.